In 1966, Leonard Newmark wrote a prescient article called How not to interfere with language learning. For various reasons, the notion of not interfering has come back to me repeatedly over the last couple of weeks. 1. 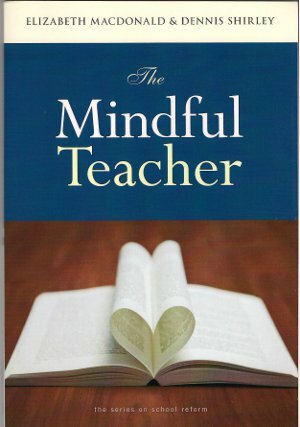 A colleague sent me a copy of a book he recently published, called The Mindful Teacher (MacDonald & Shirley, 2009). In this, he and his co-author advocate an antidote to what they describe as ‘alienated teaching’, and recommend strategies teachers can use to become more ‘mindful’. One such strategy (or synergy) is simply stopping. “And then stopping again. And then again.” They comment: “It might seem ridiculous to imagine that simply stopping could be described as emancipatory. We are socialized to believe that being busy is a virtue.” However, this constant busy-ness distracts us from responding, in a calm and reflective manner, to the complex nature of classroom events. So, drawing on principles derived from meditation, they make a good case for “stopping and taking an inner account of what is transpiring, and not allowing yourself to be rushed into actions that you might regret later” (p. 65). “By failing – or even refusing – to get out of the way, the teacher becomes the Controlling Parent. Just how often to ‘get out of the way,’ and how soon, and how far, are matters of judgement which cannot be prescribed here or in any other book. In general, however, most of us would do well to step further aside, and sooner and more often, than we are accustomed to doing. As the teacher learns to limit himself, he can give more independent meaning and value to others in the classroom” (p. 123). 3. A comment in last week’s blog (Z is for Zero Uncertainty) reminded me of a great little article on reading that came out in the ELT Journal a long while back, in which, amongst other excellent advice, Ray Williams recommends that “teachers [of reading] must learn to be quiet: all too often, teachers interfere with and so impede their learners’ reading development by being too dominant and by talking too much” (Williams,1986, p. 44). He adds that “the primary activity of a reading lesson should be learners reading texts” (p. 42). I read this piece in the NY Times yesterday, on ‘do nothing gardening’ (http://tinyurl.com/445ysgv) and there was a mention of a piece in the New Yorker titled ‘Don’t just do something. Stand there!” This intrigued me so I googled it, and came across this book: Don’t Just Do Something, Stand There! : Ten Principles for Leading Meetings That Matter (Weisbrod & Janoff, 2007). Most people think meetings are all too often a waste of time. But Weisbrod and Janoff say that’s only because of the way most meetings are run. In this book they offer ten principles that will allow you to get more done in meetings by doing less. The key is knowing what you can and can’t control. You can’t control people’s motives, behavior, or attitudes. That’s one area where most meeting leaders’ attempts to “do something” actually end up doing nothing at all. But you can control the conditions under which people interact, and you can control your own reactions. 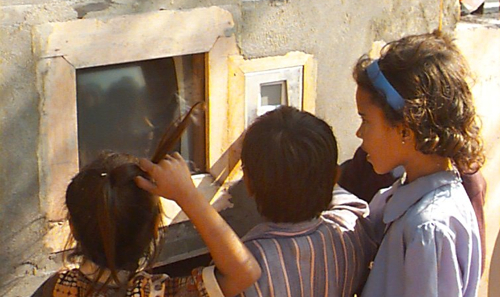 “Minimally Invasive Education is defined as a pedagogic method that uses the learning environment to generate an adequate level of motivation to induce learning in groups of children, with minimal, or no, intervention by a teacher”. On that note, I’m going to stop. I mean, really stop. I need a break. I’ll be back in September. Stay tuned! MacDonald, E., & Shirley, D. (2009). The Mindful Teacher. New York, NY: Teachers College Press. Newmark, L. (1966). How not to interfere with language learning. Reprinted in Brumfit, C., and Johnson, K. (Eds.) (1979). The Communicative Approach to Language Teaching. Oxford: Oxford University Press. Stevick, E. W. (1976). 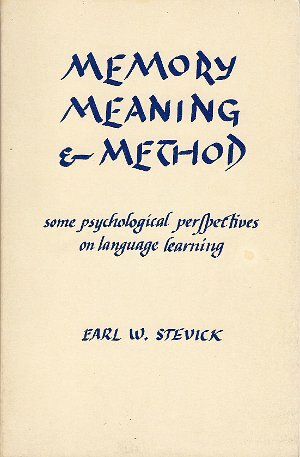 Memory, Meaning & Method: Some psychological perspectives on language learning. Rowley, MA. ; Newbury House. Weisbrod, M., & Janoff, S. (2007). Don’t Just Do Something, Stand There! : Ten Principles for Leading Meetings That Matter. Berrett-Koehler Publishers. Williams, R. (1986). ‘Top ten’ principles for teaching reading. ELT Journal, 40/1. Enjoy your stop. Hope your stop is a good one. Thanks for all your great blog posts, Sunday after Sunday, which have caused me to reflect on my practice of ELT. It has been an invaluable CPD for me, personally and professionally. Thanks, Professor B! Your feedback and support have been very motivating. I’ll resume blogging after a short break. I second what Thomas Baker has just said. This blog is always thought provoking, not only for Scott’s postings but for all the comments. It really inspires me and gets me to think, thank you everyone! I really like the Earl Stevick quote in Scott’s post and I agree with Stevick that most teachers err on doing too much in the classroom (myself included). I guess my question is, what should teachers be doing after they’ve stepped aside and let the students get on with it? Presumably not sit at the back of the classroom doing a crossword. In speaking exercises often I just like to sit and listen to my students. I nod, I say ‘yeah’ and uh-huh’ sometimes. I only offer my own thoughts when asked by a student. I find that really trying hard to listen to my students (i.e. the content of what they’re saying) has a positive effect, encouraging them to speak more. I am, by the way based in Kazakhstan where wordpress blogs have recently been blocked because they were being used by anti-government protesters (I’ve been on holiday in the UK these last few weeks so I’ve been able to catch up). Does anybody know how I can get round my problem and continue to be able to read this blog? Thanks for the comment, Thomas. Your point about being an ‘active listener’ is very important: that’s one way we can be present as teachers, without interfering unnecessarily. Another interesting idea. Scott, I’m beginning to think you like your students to be 100% in charge of your lessons (perhaps you don’t even like the term ‘student’s’ as this suggests a traditional teacher-student relationship). The above idea seems to fit with Dogme in that there is, again, less teacher involvement in the management of the class. I do wonder though how easily people find it to integrate both concepts. Both seem to require a high level of autonomy on the students’ behalf. I find in Australia, as a large portion of our students are Asian, students come more from a ‘spoon-fed’ background. Yes, these are excellent ideas but how important is autonomy and an awareness of your own learning in the success of these kinds of lessons? Hi Scott.”I’m beginning to think you like your students to be 100% in charge of your lessons.” Not necessarily, and notice that in my post I don’t actually advocate ‘letting go’, myself. I’m just interested that other people do – to varying degrees – and I wonder if this is a direction I could explore further. There is a tension (in my mind) between the importance of mediation, on the one hand, (see previous posts on scaffolding and the ZPD) and of not-interfering, on the other. Maybe it’s the difference between intervention and interference – but how do we really know which is which? @Scott C – your point about autonomy is a good one. Like you, I have Asian students as I teach in Beijing – you won’t get more deep-end than that! I think there is a contradiction as on the one hand they behave in a way that shows they want to be spoon-fed but at the same time want something different as they can often see that the traditional approach has not really worked out for them. A little like the bather who wants to dive in but is afraid the water will be too cold. Where I live, that ain’t going to happen, I’m afraid. Have a brilliant stop Scott and see you later…. ‘Getting out of the way’ is something that probably needs to be negotiated, although, as Stevick implies, there may be something Freudian about the way that some students cling desperately to the oedipal teacher, refusing to let go. (I have had trainees like that, too). As for persuading students as to the benefits of pair/group work, and disabusing them of the idea that they will ‘pick up bad habits’, that’s a tough one, not dissimilar – and partly related – to the resistance to the idea of a English being a lingua franca, and that native-like targets no longer apply. How do you deconstruct the ‘folk theories’ that learners (and trainees) bring with them? Food for another blog, I suspect. One such way I use to deconstruct the ‘folk theories’ about “picking up bad habits” (besides indicating that language learning is not a process habit formation or else you could say many a parrot is a false beginner) is to say that IF it were the case that errors could be “picked up” so easily then surely “good” English would also be acquired with equally amazing ease – however, given the nature of the resistance of some errors to change (esp. late-acquired features such as third person -s, articles), this is patently not the case. Another counter-theory (perhaps also a teacher ‘folk theory’) could be that exposure to correct English far surpasses in sheer volume the number errors in the classroom,such as to make the latter a negligible factor. Still, I’d be hard-pressed to find research to back this up. Is this idea of folk theories related to learner beliefs about learning ? Rod Ellis [CUP, 2008 ]notes that these are influenced greatly by past experiences of learning and can be changed through exposure to other types of learning (p.698-701) so it’s probably worth challenging these beliefs (if we have the evidence to support it). Any thoughts anyone ?? As far as intervention vs. interference, I’m guessing this is a finely-tuned intuition built over time – but is susceptible to training and feedback. I sometimes have recommended to teacher trainees that when monitoring, a “hit-and-run” approach might serve them and the students better, by which I mean > intervene [point something out or indicate an error etc] and then *leave* – not waiting for the self- or peer correction to be completed (but very possibly coming back a little later for a further intervention and/or to check progress). This suggestion can often help novice teachers when monitoring to avoid doing the opposite, ie. leading student by the hand through a correction or reformulation in a rather laborious and heavy-handed manner, outstaying their welcome far beyond the point where a student has already been nudged in the right direction. An overall metaphor for a lighter non-interfering pattern of monitoring I use is “like a bee to flowers” – gently drifting from point to point. The real anxiety that I notice teachers have when starting is just the simple act of sitting down – a sense of guilt seems to creep over them and they stand just “to be seen to be doing something”. The response to a seated teacher probably varies from one educational cultural to another – it would be interesting to hear how other classroom cultures respond to a such teacher non-doings. Thanks for the very engrossing blog (which often maddens me in its ability to draw me into a massively time-consuming reply to fascinating topics). Interesting topic Scott 🙂 You mentioned the tension between intervening and interference and highlighted how difficult it can be to tell which is which. This ability to distinguish the two and how to develop it is the challenge I’ve been trying to play with in Do-Nothing Teaching. I’ve found that in my own practice by simply removing habitual practices and observing the learners reactions is one useful way of building awareness in terms of what my learners truly need me to do and what they could do without. Since playing with this tactic I’ve found that in their feedback students, administrators and colleagues will often now articulate what they would like me to be doing – since I’m not doing very much 🙂 From there I can begin to build a practice that takes into account the context in which I’m working. Of course this doesn’t always work to my advantage professionally. While most reactions have been constructive and positive, my blog has been used on more that one occasion by supervisors, colleagues and students as evidence of my lack of professionalism! Declan, thanks for sharing your technique for fine tuning your teacher’s intuition. I’m curious how others distinguish between mediation and interference. Is this a skill that you feel needs cultivating in teachers and if so then how do you do it? Thanks Kevin, for coming aboard. Your blog was one of the several inspirations for this post. I LOVE the idea of stripping back to nothing and then building back up again, according to what the stakeholders want you to be doing. But, apropos of Candy’s point above, what about the student who doggedly insists on wanting your full attention all the time?! Scott, let me know when you get those signs printed up – I want one too! You asked about the students who doggedly insist on wanting my full attention. I think that in order to shape our practice to meet the learning needs of our students we need to establish a dialogue with our learners about our teaching and their learning. One way I’ve used is to create feedback loops that are an integral part of my course. This helps me to see what my learners want and expect. It also helps unveil the decisions that I’m making and why. I’ve found that through this dialogue often we can come to compromise with even the most challenging learners on practices that work for both of us. Perhaps this is pre-empting another blog entry, but I couldn’t resist. I am reminded of your assertion, Scott, (www.thornburyscott.com/assets/metaphors.pdf) that teacher’s folk theories of learning/teaching are partly based on cognitive metaphors/ images – some based on unconscious principles such as LEARNING IS A COMPUTATIONAL PROCESS or BUILDING. I totally take on board your view that changes in image/metaphor are a “valuable tool” and a “force for change” in teacher training – and I therefore feel the use of apt idioms and analogies (derived from cultural cognitive metaphors from diverse fields ?) are not simply quaint turns of phrase but can really make a difference to how teachers see things in the classroom. (SEEING IS KNOWING ?). (often in relation to the teacher “explaining” what has already been made clear and/or in re-duplicating the same aims with different tasks/procedures). It struck me that these may relate to something like TEACHING IS COOKING and TEACHING IS AN ARTISTIC ENDEAVOUR and may work in this way to create new branching node of fresh insights and images as to what a teacher is (but perhaps I’m overreaching here and these are all too under-the-radar to have this effect). Thanks for reminding me of the value of metaphors, Declan. I think a powerful metaphor is TEACHING IS NURTURING or even TEACHING IS GARDENING – it’s providing the optimal conditions for language GROWTH (read EMERGENCE). That’s why I was attracted to the article in the NY Times (referred to in my original post) about ‘do nothing gardening’, i.e. cultivating the ‘weeds’ that emerge spontaneously and naturally when once you abandon the attachment to flower beds and lawns! I can’t resist cutting and pasting from Phil Wade’s great posting, yesterday, on the dogme site. 1) Focussing on the process of learning. 2) Not knowing where the next topic will lead but welcoming it as it appears. 3) Helping students learn and progress naturally and not dragging them through a syllabus. 5) Seeing students help each other learn and becoming part of that group. 6) Moving aside from my teacher role and becoming a learning facilitator. 7) Realising that every lesson has golden learning opportunities that arise. 8 ) Understanding that learning is continuous and that it happens outside, inside and without the class and all this should be taken into account. 9) Deflating my ego of being ‘the teacher’ and ‘bestower of all knowledge’. 10) Appreciating that I have real people in my class who trust me to help them learn and improve themselves through our time together. 11) Accepting and enjoying getting to know the learners and not just asking for their needs and opinions but making every class centred on them. Thanks Scott. It doesn’t get better than this. I have to point out though that this was in response to just one short part of a very thoughful post by Mr Haines (Rob) which we could discuss for the next 10 years. Perhaps one more thing I’ve learned from this blog and the Dogme group is that we as teachers should also keep learning and improving. This shows the students that we enjoy what we do and we want to make their learning as good as it can become. I suppose it’s the ‘eternal learner-teacher’ idea. Thanks again and I look forward to more great posts. Thanks, Phil. “The ‘eternal learner-teacher’ idea” – you would seem to be a good example of this yourself, judging by your posts on the dogme site. Incidentally,the dogme site seems to be a good example of the way only minimal intervention is necessary, once there is a ‘learning community’ in place. It’s the on-line equivalent to the ‘hole-in-the-wall’ perhaps! I often think that the reason that people find taoism difficult to understand (apart from the rather peculiar writing styles of taoists) is because we live in a world that is so at odds with its principles that we struggle to get to grips with the simplest things. There is nothing particularly challenging about dogme or taoism, but they cause problems. Might this be because they stop short of defining themselves and leave implicit the notion that it is what you make it? As for intervention and interference – I think I try to take a natural approach: if I feel that whatever has been said or written would either be misunderstood or not understood by a non-TEFL worker, I challenge it. In the back of my mind I have the idea that as language teachers, we are about trying to help people project an image of themselves which corresponds in the main to the image that they are trying to project. So when I receive an email that says, “Hi. I am Chen. Send me the homework,” I respond by pointing out that this comes across as rude, demanding and authoritative. I ask if this is what they were trying to do. I challenge them to try again. As a language teacher, I’m not just thinking of my understanding of what gets said or written, I’m thinking of how other people might respond as well. So, we don’t talk about degrees of formality in class, we talk about degrees of power, subservience, distance, caution. My academic students need to know that language can make them seem more knowledgeable; that they can stake a claim in the hierarchy by using one set of words and phrases; that they can build friiendships by using another set of words and phrases. Practical uses of language. And whilst they are learning these things, I stand back and watch the others. Many of the students are used to talking exclusively to the teachers. That is, if X is sitting there completely oblivious to what Y is saying, it is up to the teacher to stop the lesson, ask X if they understand, direct X to get Y to be clearer and then Y will still talk through the teacher. This is a challenge which I have still to come to terms with: how to get the students actually talking and listening to each other. It happens sometimes, but how can I make it happen all the time? Because there is something in the idea of doing-without-doing. But it’s not easy when you are working in a society where people expect you to do-as-has-been-done. If students are used to the teacher being the Ultimate Arbiter, then the teacher who does nothing is seen as lazy and ineffective. Ironically, I guess the teacher must be seen to be doing by doing nothing. That is, they must be seen to be listening, responding, reacting but should not be seen to be correcting, rephrasing, reproaching. Where possible, they should be seen to be directing other people to get involved. Where not possible, they should be furnishing enough clues to let the students work it out for themselves. They should be able to point out that it is NOT bad to spend most of the class working in small groups with people who cannot pronounce words like the Queen of England. It is good because it means that you have to work harder to develop your listening skills and have to work harder to express your meaning in a way that can be understood. It is good because the probabilities are that when you leave the classroom, you will have to speak English to people who are not English. Lao also said that one needs to know where to stop, and as the length of this comment indicates, I am still very much a taoist in training. Apologies. And enjoy the break, Scott. Thanks, Diarmuid. I purposefully avoided mentioning the Tao, knowing it was really your territory! No, just kidding. In fact, in The Mindful Teacher, MacDonald and Shirley derive some of their core arguments – not from Taoisim – but from the precepts of Buddhism (which I know is not the same thing, but as I understand it, the two doctrines do belong to a similar contemplative tradition, as well as sharing a somewhat enigmatic rhetorical style). MacDonald and Shirley refer to an article in the Harvard Educational Review (no less! ), called ‘Zen and the art of reflective practice in teacher education’ (Tremmel, 1993), in which the author ‘has shown that aspects of Buddhist understanding of mindfulness can be infused into teacher inquiry activities to reduce teachers’ presuppositions about their pupils, to attend more fully to pupils’ actual learning processes, and to track and modify their emotional responses to classroom interactions’ (p. 25). I find that in teacher education we often give focus to “shaping the clay” and perhaps not enough focus on “the space within that makes it useful.” I think that part of this is that as learners of learning we have to reshape the way we conceptualize teaching. Here at SIT we’ve tried to really embrace Gattegno’s principle of learning being subservient to teaching. We try to encourage students to explore their own process and to begin to appreciate moments where we struggle and try to figure out as a valuable part of the learning process. That said, as a teacher “off the hill” I’ve found that trying to balance the stakeholders expectations with my own beliefs about teaching and learning to be one of my greatest challenges. Hope you really enjoy your break, Scott: you’ve certainly baffled me by how you have kept up such a long string of regular and rewarding posts. Hi. Has anyone reading this allowed their class to fall into an “awkward silence”? I mean the kind where you ask an open question like “how are you?” and just sit (or stand) there and wait andi mean really WAIT until someone speaks up and then you don’t say anything more than “uh huh” while nodding and smiling while you wait for SOMEONE ELSE to respond and so on. If not, try it. Awkward? Definitely. But worth it? Absolutely. Students catch on and begin to before pro-active–prompting one another to speak and since they know I will NOT fill in those awkward silences during class discussions, they (not everyone but most) take the responsibility and they learn an important skill in the process: conversation. I don’t actually have news of either sort in most cases, but the response from students is always immediate, and I’ve become rather adept at letting them create the news on their own (and it’s usually good and better in the end!). Late to the party once again, am I. Given the topic, I’d thought no reply at all perhaps befitting; however, with summer waning and the autumn setting in, I feel compelled toward gratitude. Your blog, your articles in ELT publications, and the ‘long conversation’ you started with a group of like-minded individuals have attracted many thoughtful, passionate, and articulate contributions, which have inspired (and challenged) me and informed my practice. So, thank you, Scott, and everyone, for all you do. A question arises as I consider how much I’ve benefited from these online interactions: Does the digital age enhance a teacher’s (and colleague’s) ability to not interfere? You know what? I think it does. A lot. I’ve found ways to ‘bottle’ a lot of the more formal learning into digital format, which allows me to sit back or wander about and just have more conversations with pockets of the class at a time. I eventually tried to get back up in front of the class to see how it might be different and it was just lousy in comparison. Evidently they like the teacher getting out of the way and letting them get on with it (the ‘business’), while from my end I’m noticing how rich and pleasant the actual relationships are becoming. Thank you for your reply, Jason. I’m going to have Monday classes in a computer lab next term as it was the only “classroom” available, so I’ll take your account to heart.